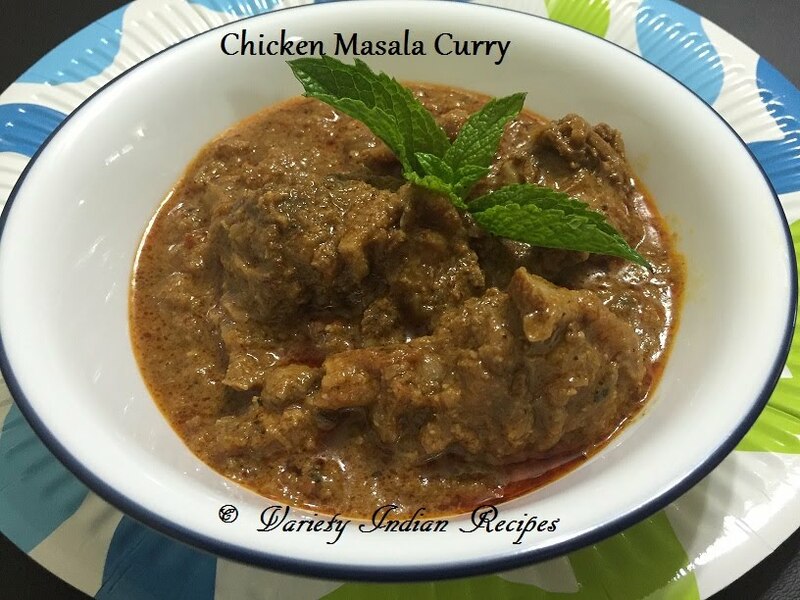 Chicken Masala curry is a perfect gravy for Roti /Chapathi/ Naan. Here chicken is simmered with Indian spices giving a spicy mouthwatering gravy. Heat a table spoon of oil in a pan. Roast the above ingredients (pepper, cinnamon, cloves, jeera, fennel seeds, onions) until the onions are browned. Allow to cool and grind the mixture. Grind grated coconut to a fine paste. Marinate chicken with curd, 1/2 tbsp red chilli powder, turmeric powder and salt for half an hour. Heat oil in a pan, add bay leaf, cinnamon, cloves. Add onions and saute till the onions become translucent. Sprinkle little water and allow the onion to cook until the oil separates. Add tomatoes and saute until tomatoes are mushy. Add coriander powder, red chilli powder and saute. Now add the ground spice paste (paste containing pepper, cinnamon, onion) and saute for 2 minutes. Add marinated chicken, salt and saute. Add 1 cup water and cook with a closed lid for about 20 minutes, until the chicken is soft and tender. Once the chicken has cooked add the ground coconut paste and stir well. Now spicy chicken masala curry is ready. Serve hot with Roti.